The Church liturgically honors Saint Anthony of Padua, a Franciscan priest, renown preacher, miracle-worker and Doctor of the Church (1195-1231). Saint Anthony is clearly a pivotal figure in the hearts of many Catholics. His biography is very intriguing. Here is the Blessing of Lilies for the feast of Saint Anthony of Padua. Born in Lisbon, Portugal, in 1195, Fernando de Bouillon was of a noble family related to the famous Godefroy de Bouillon, founder and first sovereign of the Latin Kingdom of Jerusalem, who at the close of the Crusade of 1099 had refused to wear a crown, there where Christ had worn one of thorns. Favored by nature and grace, Fernand resolved at the age of fifteen to leave the world and consecrate himself to God in the Order of Canons Regular of Saint Augustine. No flattery, threat or caress of his relatives could persuade him to leave that holy refuge. He asked to be transferred to another convent to avoid the family’s solicitations, and was sent to Coimbra. Still young, his sanctity became evident through miracles; he cured a poor religious whom the devil was obsessing, by covering him with his cloak. When this young monk decided, after witnessing the return of the martyred remains of five Franciscans who had gone to Africa, to join that Order so favored with the graces of martyrdom, the Augustinians were desolate but could not prevent his departure, for Saint Francis himself appeared to him in a vision in July 1220, and commanded him to leave. He was then sent by the Franciscans to Africa, but two years later was obliged to return to Italy because of sickness; thus he was deprived of the martyr’s crown he would have been happy to receive. In 1222 Anthony, as he was now called, went with other Brothers and some Dominican friars to be ordained at Forli. There Fra Antonio rose under obedience to preach for the first time to the religious, and took for his theme the text of Saint Paul: Christ chose for our sake to become obedient unto death. As the discourse proceeded, the Hammer of Heretics, the Ark of the Testament, the eldest son of Saint Francis, stood revealed in all his sanctity, learning, and eloquence before his rapt and astonished brethren. He had been serving in the humblest offices of his community; now he was summoned to emerge from this obscurity. And then for nine years France, Italy, and Sicily heard his voice and saw his miracles, whose numbers can scarcely be counted. A crowd to which he was preaching outdoors one day, when the church was too small to hold all who came to hear him, amidst thunder and lightning felt not one drop of water fall upon them, while all around them the rain poured down. And men’s hearts turned to God. We may wonder why we always see Saint Anthony with the Child Jesus in his arms. The account of this heavenly visitation was told only after his death, at the official process concerning his virtues and miracles. It was narrated by the man who witnessed the marvel in question; the Saint himself had never spoken of it. Saint Anthony was in the region of Limoges in France, and was offered hospitality, rest and silence by this businessman of the region, in his country manor. He was given a room apart, to permit him to pray in peace; but during the night his host looked toward his lighted window and saw in the brilliance a little Infant of marvelous beauty in the arms of the Saint, with His own around the Friar’s neck. The witness trembled at the sight, and in the morning Saint Anthony, to whom it had been revealed that his host had seen the visitation, called him and enjoined him not to tell it as long as he was alive. The town near Limoges where this occurred remains unknown; the original account of the inquiry does not name it, but says that the man in question narrated it, with tears, after Saint Anthony’s death. After a number of years of teaching of theology, unceasing preaching and writing, Saint Anthony, whose health was never strong, was spending a short time of retreat in a hermitage near Padua. He was overcome one day with a sudden weakness, which prevented him from walking. It progressed so rapidly that it was evident his last days had arrived. He died at the age of thirty-six, after ten years with the Canons Regular and eleven with the Friars Minor, on June 13, 1231. The voices of children were heard crying in the streets of Padua, Our father, Saint Anthony, is dead. The following year, the church bells of Lisbon rang without ringers, while in Rome one of its sons was inscribed among the Saints of God. Reflection. Let us love to pray and labor unseen, and cherish in the secret of our hearts the graces of God and the growth of our immortal souls. Like Saint Anthony, let us attend to this first of all and leave the rest to God. The memory of one of the great Franciscan theologians is venerated today, Blessed John Duns Scotus (1266 – 1308). His bones rest in Cologne but he hails from the Scotland. Known to the theological world as the Doctor Subtilis, one of his claims to fame was his advocacy of the dogma of Mary’s Immaculate Conception. Pope Pius IX used Scotus’ theology in helping to frame what we believed in terms of the Immaculate Conception of Mary in 1854. One of the Scholastics, John taught in the school of thought of the Augustinian-Franciscan tradition, who also had a rich appreciation for the works of Aquinas, Aristotle and the Muslim philosophers. 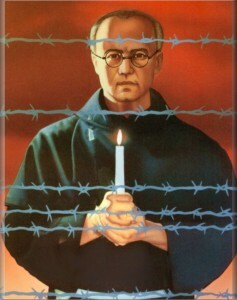 O God, who filled the Priest and Martyr Saint Maximilian Kolbe with a burning love for the Immaculate Virgin Mary and with zeal for souls and love of neighbor, graciously grant, through his intercession, that striving for your glory by eagerly serving others, we may be conformed, even until death, to your Son. 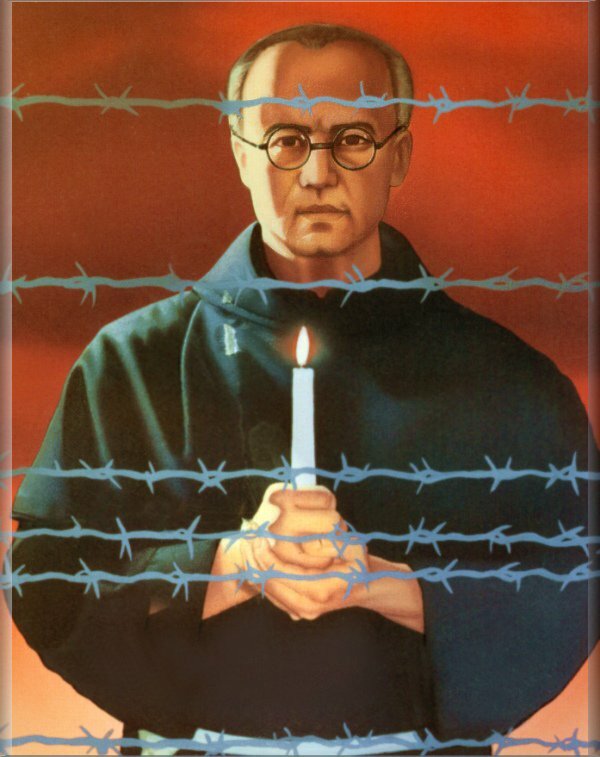 I think the first canonization of a saint, in this case a martyr, that I first encountered as a child was Kolbe’s. It was a brilliant move of John Paul II. 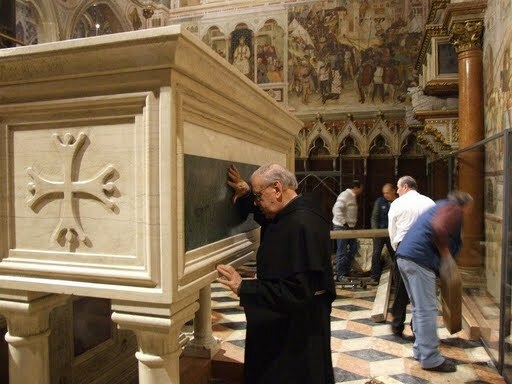 This Conventual Franciscan’s ability to love another to the point of sacrificing his life portrays the theodrama of the Paschal Mystery in great proportions. When I went to the death camp where he met his Lord and Savior I was filled with peace and love. But I was also aware that only a Christian’s love like Kolbe’s could rightly interpret the experience. More than anything else that can be said of the life of Saint Clare of Assisi it is her example of being at the foot of the life-saving Cross. This icon shows us that the cross means sacrifice and service. An abbess, as an example of what the Lord would do, washes the feet of the disciples. 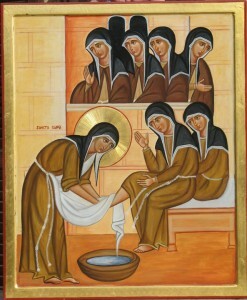 Saint Clare’s radical example is not easy to follow but I think it ought to be an aspiration. May she show us the path to the Lord. I believe that Clare opens a door of what Christian discipleship means. Prayers for the Poor Clare nuns. 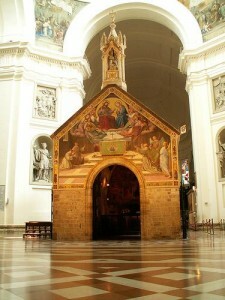 Today the Church observes a Franciscan feast of Our Lady of the Angels on which the “Portiuncula” Indulgence is offered. You may not be encountering this feast in a lot of places, but it is very worth knowing. You can also read last year’s post on this feast. As you know from the personal history Poverello, he repaired three chapels, the last of which is typically called the Portiuncula or the Little Portion, dedicated to Our Lady of the Angels. The chapel now exists within the larger basilica church as seen in the picture. 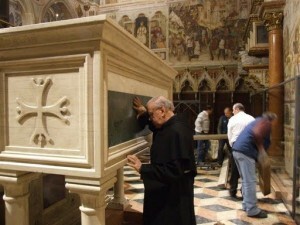 It is here that Franciscans identify their spiritual home. Moreover, it’s here that Saint Clare professed her vows on Palm Sunday in 1212 and where Francis died on October 3, 1226. The Franciscan tradition tells us that Our Lord accompanied by Our Lady appeared in 1216 Francis who was encouraged to requested from Pope Honorius III to grant an indulgence to all who visited the Portiuncula chapel. Later popes expanded the indulgence to include churches administered by the Friars, and now the indulgence is offered to anyone who fulfills the obligations (see below) in any church. prayer for the intentions of the Holy Father (see the blog entry on August 1 for the intentions) on the day the indulgence is sought (recitation of the creed, 1 Our Father, 1 Hail Mary suffice, or any other suitable prayer). If these conditions are not met, the indulgence will be partial.